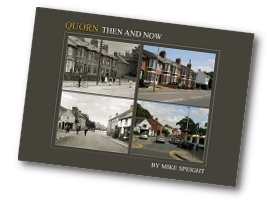 Containing over 400 photographs dating back to the 1890s, ‘Quorn Then And Now’ is a brand new book by Mike Speight. The book also includes copies of many interesting documents - including the programme of events to celebrate the opening of the Village Hall in 1889 and the 1953 Coronation celebrations. Page by page, the book takes you from Quorn Cross, along Station Road, School Lane, Leicester Road, Loughborough Road etc, and there are several pages dedicated to village characters from a bygone age. Several villagers have provided some interesting recollections of their life in the village and to bring the book into the 21st Century, there are photographs included to highlight the changing face of the village. The book is priced at £12 and consists of 110 pages - all profits will be donated to The Rainbows Children’s Hospice and the Quorn Old School project. If you would like to order a copy of the book, please phone Mike Speight on 01509 413 268 - if you are unable to collect the book yourself, Mike will arrange for the book to be mailed to you.